This week we will look at another French Panini variant! 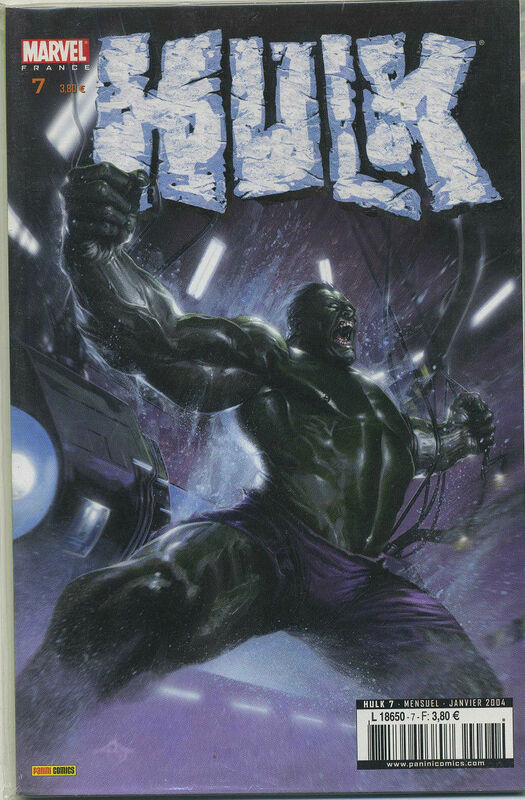 This time it is the Incredible Hulk #7, from January 2004. This comic has so many things going for it! First off, the cover is by Gabrielle Dell’Otto! Next up, it is a reprint of Incredible Hulk 34 and 35 (from the 2nd series). This was the beginning of the amazing run by Romita Jr and Bruce Jones. In my opinion it was the first time the comic run had started to mirror the show from the 70’s, i.e. the lonely man on the run. Finally, like most Panini comics, it has a print run of 3,000. I will not say these are impossible to find. I have followed these on ebay for a while. They do pop up somewhat consistently. Usually it will run you anywhere from $25 – $50. If you are a Hulk fan (like myself) or a Dell’Otto fan, you have to add one of these to your collection. Happy Hunting fellas! Great article but i’d like to correct something about the print run. It isn’t limited to 3000 copies as it was the regular cover you could find in the French newsstands and comic shops. Keep up the good work and thanks for spotlighting a foreign version. Very cool! Never seen before! The Beast cover he did for a Panini Xmen book was a great cover as well, but that Hulk is sweet!